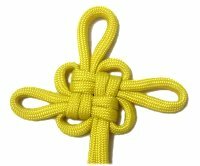 Description: The Good Luck Knot has four small and three large loops surrounding a woven square in the center. It's a beautiful Chinese knot that's been around for thousands of years. 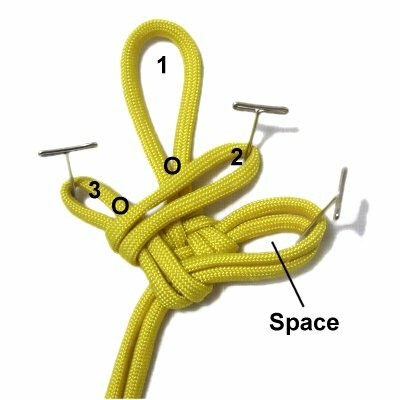 This is a thick knot, so using 2mm to 4mm size material will make it less bulky. Any material can be used, but Paracord will really help show off the woven square shape. 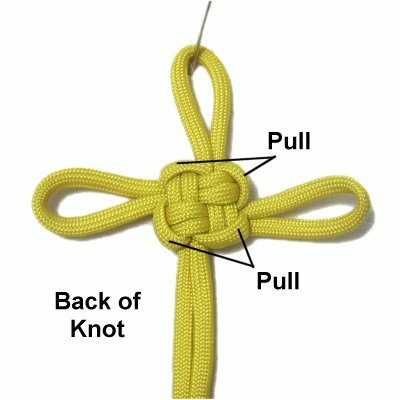 This unique design is based on the Crown Knot, which is a basic Macrame knot. 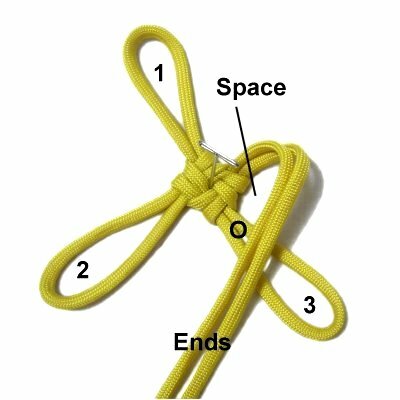 Try practicing that knot first, if this design proves too challenging for you to make. 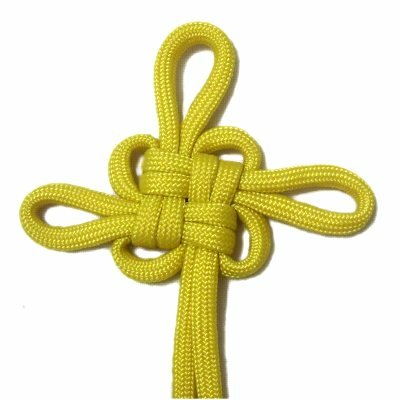 The Chinese Flower is a variation of this knot. It has five petals rather than three, and is now on a separate page. 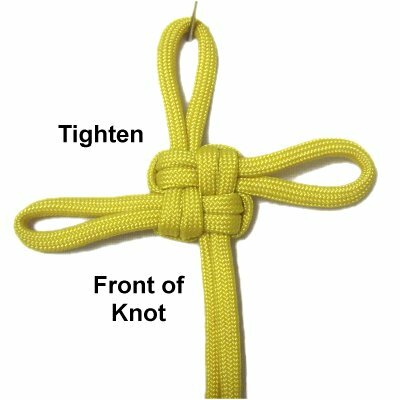 2017 Update: This is the official name for knot, so the title has been changed. The bights have been decreased in size so the loops won't need adjusting once the knot is finished. To practice the Good Luck Knot, you need one cord at least 60 inches long. Size 550 Paracord was used in the images shown. Make sure you prepare it properly if you decide to use it. See Cord Preparation for details. Step 1: Fold the cord in half, and secure it to your board, so the ends are heading forward. 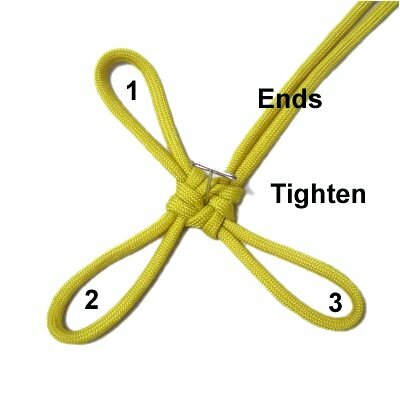 Fold the cord to make bights on the top, right and left. Mentally number them as shown. Each bight should be 3 inches long if you are using 4mm size material (2.5 inches long for 2mm cord). Step 2: Fold the two ends backward and slightly to the right, so they pass over bight 1. Make sure you leave a space as shown. Placing a pin at the fold is recommended. Designer's Tip: When you fold a cord, you don't just curve it. You actually turn the cord upside down as you move it into place. You can see this in more detail in the following images. Be sure to click on the photos to see larger ones, which show the details more clearly. Step 3: Fold bight 1 to the left, passing over the ends as well as bight 2. Step 4: Fold bight 2 forward, passing over bight 1 as well as bight 3. Make sure you can clearly see the space made by the ends when they were folded. Step 5: Fold bight 3 towards the right, passing over bight 2. Pass it through the space made by the ends, so it goes over - under the folded area. 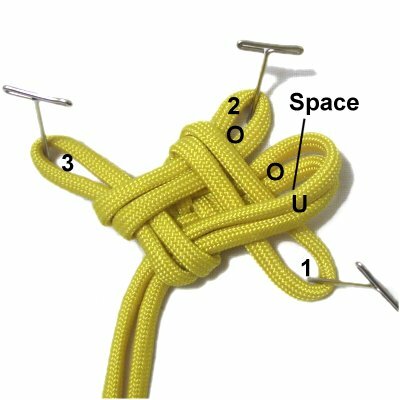 Step 6: Tighten the first half of the Good Luck Knot slightly, then remove the pins and tighten it the rest of the way. Make sure it remains in the same position on your board. Step 7: Fold the ends towards you (forward), passing over bight 3. Make sure you leave a space. Secure them to your board. Step 8: Fold bight 3 to the left, passing over the ends as well as bight 2. 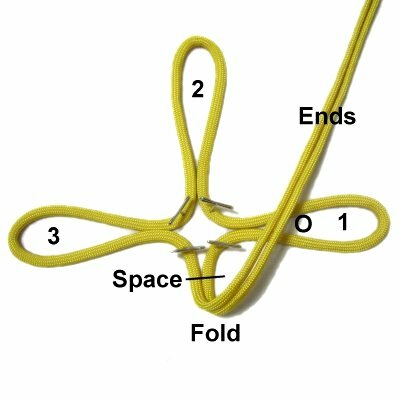 Make sure the folding takes place very close to the first half of the Good Luck Knot, since the bights are smaller now. Step 9: Fold bight 2 to the right, passing over bight 3 as well as bight 1. Identify the space you left when you folded the ends. Step 10: Fold bight 1 forward (towards you), passing over bight 2. Pass bight 1 through the space under - over the two segments. 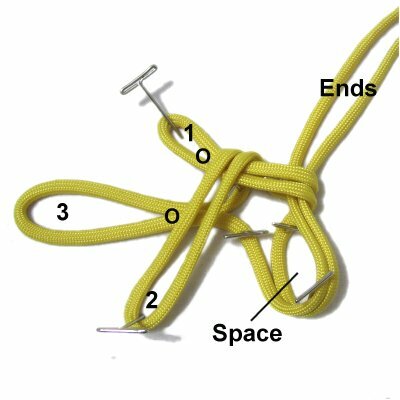 Step 11: Tighten the Good Luck Knot by pulling on the bights and the ends. The surface you have been looking at is the front of the knot. Turn the knot over so you can see the back. 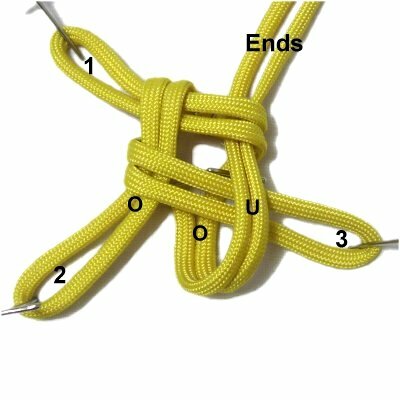 Step 12: There are four segments on the edges of the central knot that rest between the loops. You can pull those segments to make the small loops between the larger ones. This is optional if you prefer to leave them flat. 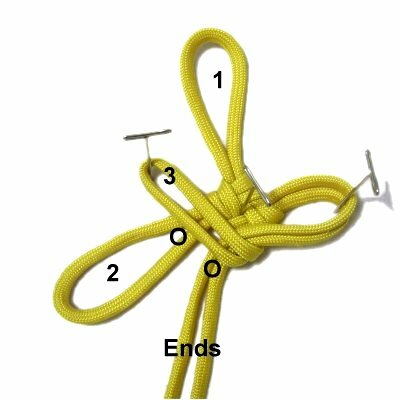 Step 13: After the loops are the right size, turn the knot over to see the front again. 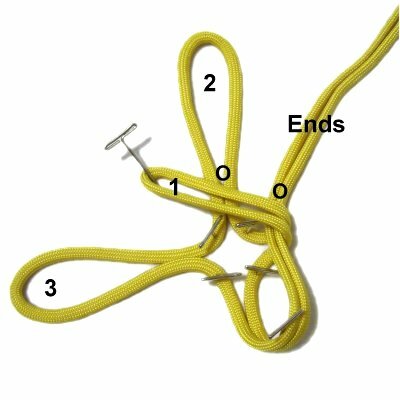 For a design without the four small loops, you can reverse the knot so the back is showing instead of the front. 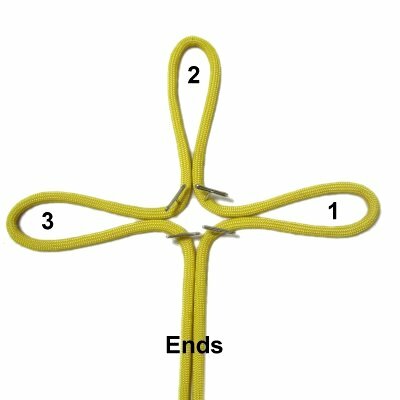 Have any comments about the Good Luck Knot? Contact Me.